Coffee Shop Project has a great artist this month to cheer you up with up-temp songs. CSP is featuring Montreal based singer songwriter, Nash for this month's free music download card, which you can obtain across the city. 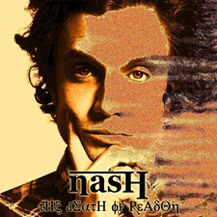 His delightful songs from the latest album, The Death of Reason, will warm you up along with your cup of coffee. Here is the latest video of his performances, Friendz R Drugz and In a State of Mind via Southern Souls.